Evidence has now emerged to support long standing allegations that Royal Bank of Scotland secretly tried to profit from struggling businesses using its notorious Global Restructuring Group. Its Irish subsidiary Ulster Bank had a similar division called Global Restructuring Group Ireland. 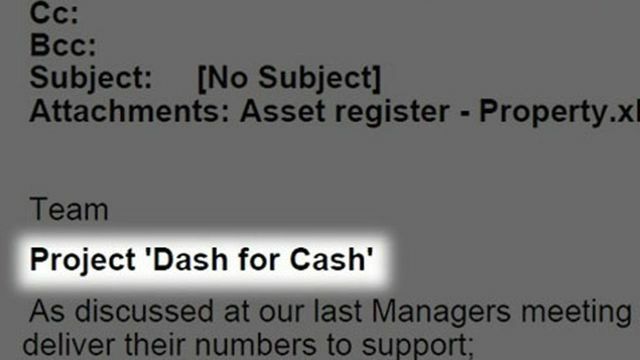 The evidence includes an email circulated internally that stated that staff could boost their bonuses by finding firms which could be squeezed in what it called a "dash for cash." Staff were told cash fees will principally come in the form of restructuring/exit fees and were encouraged to think of all those customers that "could be in breach of covenant if their loans were revalued now". Staff were urged to find reasons for transferring customers to the GRG. One reason was where the customer was litigating against the bank. If as RBS says the GRG was established to help customers then why would it go out of its way to help them? The reports confirm that many of the small business owners affected say they have not only lost their businesses but also experienced family break-ups and deteriorating physical and mental health due to the stress of their treatment at the hands of the bank. Others have been made homeless or bankrupted. Meanwhile the GRG generated a profit of £1.2 billion in just 2011 alone. In 2012 RBS put 1,483 business customers into the GRG. Only 452 were returned to normal banking. By contrast Ulster Bank, a subsidiary of RBS was not nearly as successful in helping its customers to "recover" using the Global Restructuring Group Ireland. 2,141 customers were transferred with or without notice from ordinary banking into the GRGI. Of that just 6 were returned to normal banking. A report commissioned by Ulster Bank in 2014 cleared it too of all wrongdoing just as a similar report commissioned by RBS had done so in 2013. He ended up losing his business and says the bank cost him his health, his home and his marriage.